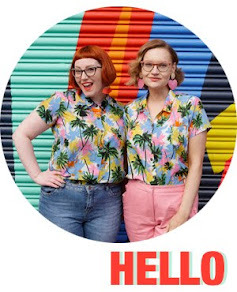 I only recently came across We Are Hairy People on ASOS marketplace but their hand painted basics are all so cute. I stumbled upon them because I've been looking at a lot of gull prints and the added flying chips in this one takes this one to another level. I love a simple silver piece of jewellery and Drift Riot is doing it right. I also love the wishbone necklace. Actually I love anything with a wishbone. But these are excellent versions. Okay, everyone is in love with these shoes. With good reason! Look at them. And I think £50 is pretty reasonable for these beauts. I also have to share my deep love for the sequin top. OH EM GEE!! These were sent from heaven for me, I'm sure of it. No explanation needed- these are simply amazing. Saved by the Bell is always top on my style icons and Dundee locals Dreamland Clothing have come up with an awesome 80s print in two different style/ colours. Need! I'm always in need of a good case and you can't go wrong with a fish shaped one. Not into this skate shaped one? There are loads of fish shapes available on the Don Fisher site, all in a variety of sizes and dreamy hues. A fish for any occasion. The Valfre online store is jam packed full of fabulous things. I could make a whole wishlist dedicated to their sassy slogans and even sassier ladies. I love this Goodbye jacket because the planet has an eye. Eye prints and motifs are still my favourites. The Grow a Pair jacket would also be high on my list. You can never have too many jackets, right? Simple ceramic faces are another favourite of mine. Zodiac and Zepphyr specialise in such things and have a fine collection of dishes sporting pretty faces. Dishes can be very handy but this little brooch is wearable and that always wins for me. This top is a liar. It's full of fun with it's pastel colours and neon sign lettering. The fact it's so fun, while purporting not to be, makes me smile. When I spotted that awesome illustrator Lynnie Zulu was going to be collaborating with Monki I was more than a little excited. The result is a full on feast for the eyes. The colours, the patterns, the bags - I WANT IT ALL! So funny that when I met you, Helen, you were wearing an item from Kimberley's wish list! That dress was super fun. And I looooove that wishbone cuff.